In this free informational email series you will get an email every 3-5 days with more information on using the Gut and Psychology Syndrome protocol to heal and seal the gut lining and reduce/eliminate your allergies! I love this protocol, I used it myself a couple years ago and was able to eliminate my dairy allergy in just 6 weeks! 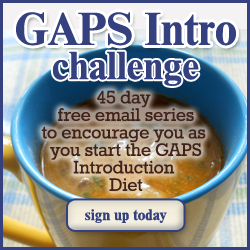 This email series has you starting GAPS Intro 15 days from the date of sign up. *fine print: This is a 45-60-day free email series. Your email address is safe with me! I'm providing this email series because I have found this diet to be amazing for our family, I do sell products to help families complete this diet, but what I sell is not necessary to purchase- I tell you exactly what the diet is about for free! If you'd like to see what I sell, it's the 30 Days on the GAPS Introduction Diet for gut healing and sealing.